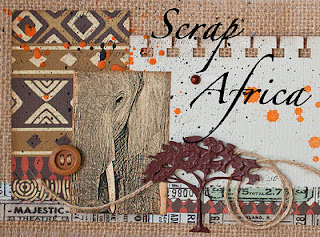 We are very excited to welcome you at our brand new challenge blog Scrap Africa! Why did we start this blog? Simply because we want to showcase and celebrate the creative talent that we have in our beautiful land. At the same time we want to share it with the rest of the world and be inspired by others. While we will focus on scrapbooking in Southern Africa we hope that our challenges will attract scrappers from different parts of the world. Every 2 weeks on Thursdays we will publish a new challenge for you. You will have 3 weeks to complete it. We will alternate sketch challenges for lay-outs with theme challenges. For our theme challenges you can create any kind of scrap object - it can be a lay-out, a card or an altered object as long as you follow the requirements of the challenge. You can combine our challenges with challenges from other blogs. Only make sure that you do not combine similar challenges together. You also cannot take part in two challenges on our blog with the same project (our challenges will overlap and therefore you cannot for example make a lay-out using our sketch and then enter same lay-out into the theme challenge on Scrap Africa). Our design team will choose the best entries which we will feature on Scrap Africa blog. We will also choose someone to be our guest designer for one of the challenges. We plan to have sponsors for our challenges. After every two challenges (a sketch and a theme challenge) we will randomly draw the prize winner among the participants. We think that this new venture is something worth celebrating. And what is a celebration without a gift? Copy the picture from this post and post it on your blog or in any other internet community.Tell your friends about Scrap Africa and our give-away. Then link your "hoot" with the linking tool at the bottom of this post and stand a chance of winning a gift pack with wonderful scrapbooking goodies to the value of R 300 from the authors of Scrap Africa. ***This give-away is open only for South African and Namibian scrappers. Only one entry per person. Good luck and don't forget to check our first challenge! TO VISIT THE SCRAP AFRICA BLOG. REMEMBER TO LINK TO THEIR POST TO STAND A CHANGE OF WINNING A GIFT PACK!